I'm on vacation in beautiful Park City, Utah with Henry, Cory and Camille. We're skiing, snowshoeing, hiking and cooking up a storm in our rental house in Deer Valley. Shopping for fruits and vegetables was a challenge unless of course you count the California produce in plastic containers in the fridge, but I was able to get some locally and sustainably grown meats from the supermarket (bison and lamb from Colorado) and goat yogurt, purple raspberry jam, lamb salami, homemade ice cream, and "treehugger" granola from the brand new The Market Hall in the outskirts of Park City at the Redstone Mall. 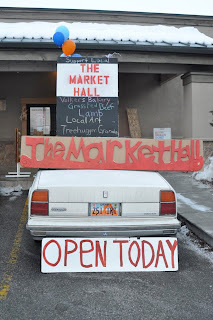 The Market Hall, an indoor farmers market located on Ute Blvd. in Park City, is a ski resort town's answer to extending the Park City and Salt Lake City farmers markets into the cold months. I can't believe I found this place. It's only been open for 5 weeks. And, what a treat. Camille and I were greeted by Kurt Von Puttkammer, a market co-founder, and friendly, informative market manager. His partner, Jesse Swing, also said hello. Kurt is an organic CSA farmer and an architect by training, a "recovering architect" he said with a smile. Kurt had a hand in the development of the Redstone Mall where the indoor market is located. 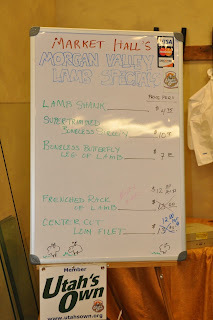 Several months ago, Von Puttkammer and Swing connected the dots between the community aspects of a seasonal farmers market and the high vacancy rate at the mall and were able to secure a year-round lease at a rate that enabled them to start an indoor farmers market with affordable vendor fees for the permanent and rotating merchants who sell on Tuesdays, Thursdays, Fridays and Saturdays. 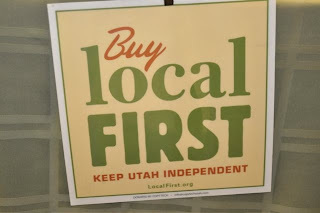 The Market Hall showcases some "Utah's Own" finest produce* -- Utah's Own is a state supported and locavore initiative. The vendors all embrace sustainable practices and the market not only features lots of food but also locally designed crafts and tie-died t-shirts. There's even a locally-owned (circa 1970s) pipe shop selling water pipes, bongs and hookahs. 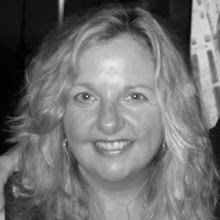 Zoe's Garden - local CSA that makes wonderful jams and other goodies. 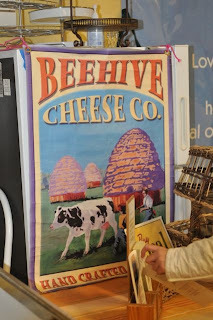 Beehive Cheese Co. - award winning, included a lavender and coffee infused cheese, Beehive makes aged cheeses from Utah cow's milk that is sold in Utah, California, New York and around the country. 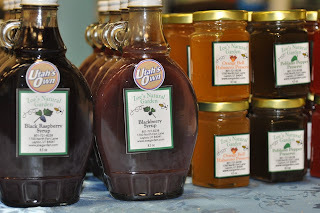 * Utah's made and grown in Utah program is called Utah's Own -- this web link takes you to a listing of growers, producers, farmers markets and retailers selling Utah's organic, farm raised and local foods and its many places to shop. 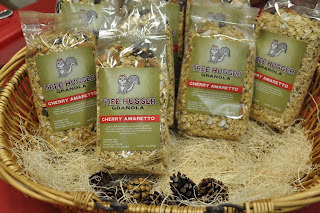 It really is a fun place to shop for excellent breads and baked goods, high quality meats and fish plus gelato and other locally created arts, crafts and boutique items! In one fun, energetic place, you can combine the joy of buying high quality goods at good prices while getting to know and supporting your locals growers and craftspeople, and all the while be more sustainable than going to your average supermarket! It is 21st century live-ability at its best! I'm jealous -- New York needs a Market Hall.